Sprit Rugs - Bold designs and rich colours are what make our Sprit rugs so popular. Whether you choose the Butterfly, Panel or Diamond design, you will be creating a focal point in your room and by incorporating a few well-chosen accessories such as cushions and lamps, you will have a modern and unique room instantly. All of our Sprit rugs are made in the EU from a hard-wearing, colour-fast, anti-static and water resistant material; so you can be sure that you new rug will be long-lasting and the bright oranges, reds and purples in our designs will remain vibrant and eye-catching. 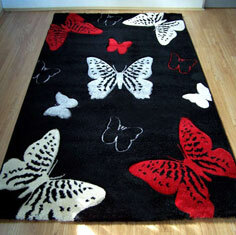 With a Sprit rug you will soon realise that cheap rugs can still be quality rugs!